CARLA 2018 will be host in the Guatiguara Techonology Park (PTG) of the Universidad Industrial de Santander (UIS), at Guatiguará Valley in Piedecuesta is part of the Bucaramanga Metropolitan Area (30min from Downtown). It's not just about * women * in HPC ... it's the diversity of these women, we need more passionate and eager women to do science. People will not join STEM Workforce until they can see how exciting this world is. The use and development of High Performance Computing in Latin America is steadily growing. New challenges come from the capabilities provided by clusters, grids, and distributed systems for HPC, promoting research and innovation in this area. Building on the great success of the previous nine editions, this year the Latin American Conference on High Performance Computing (CARLA 2018) will be held in Bucaramanga – Colombia, from September 26th to 28th. 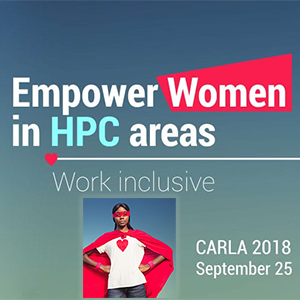 The main goal of CARLA 2018 is to provide a regional forum fostering the growth of the HPC community in Latin America through the exchange and dissemination of new ideas, techniques, and research in HPC. The conference will feature invited talks from academy and industry, short- and full-paper sessions presenting both mature work and new ideas in research and industrial applications. #CARLA2018 participants love the technology and the HPC world. Don't forget to attend "The Panel of Women in Technology and HPC" in Latin American Women in HPC Workshop. Meet Fernanda Foertter, a passionate computer enthusiast in the areas of Big Data analysis using high performance physics and computer simulations. She currently works at Deep Learning Alliance Manager and GPU HPC + AI at NVIDIA. The goal of workshops is to provide attendees with a focused and in-depth platform for presentations, discussion and interaction in a specific subject area. The workshops will be held on Thursday, September 25, 2018 and will be either half-day (9:00 am – 12:30 m or 2:00 pm – 5:30 pm) or full-day (9:00 am – 5:30 pm). The goal of tutorials is to provide attendees with hands on sessions in a specific subject area. The workshops will be held on Sunday 23th and Monday 24th of September 2018 and will be either half-day (9:00 am – 12:00 m or 2:00 pm – 5:00 pm) or full-day (9:00 am – 5:00 pm).